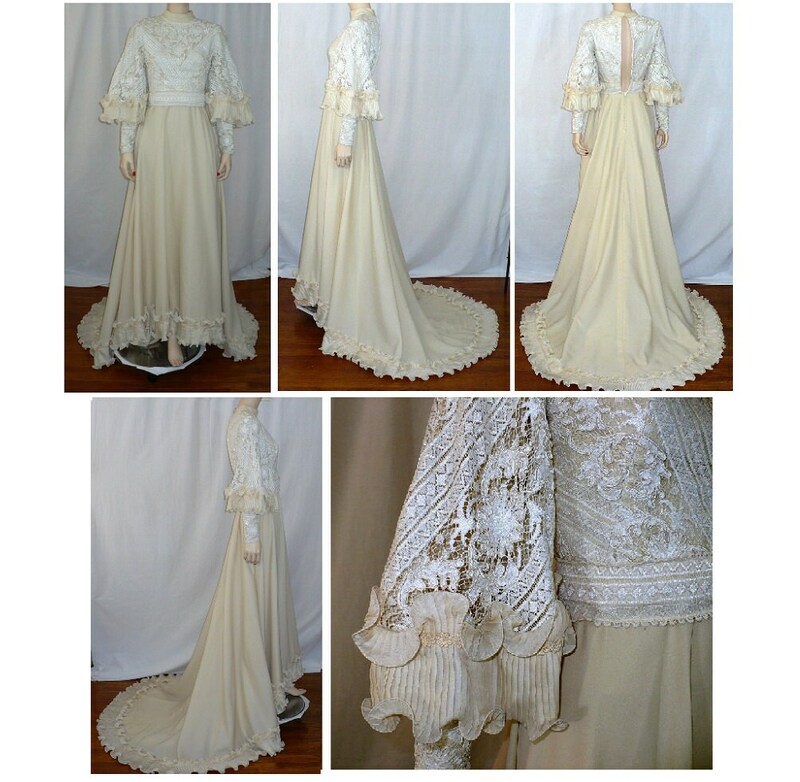 Victorian Revival wedding dress brings My Fair Lady and Audrey Hepburn's graceful style to mind. White lace with ecru body. Stunning, modest and flattering. 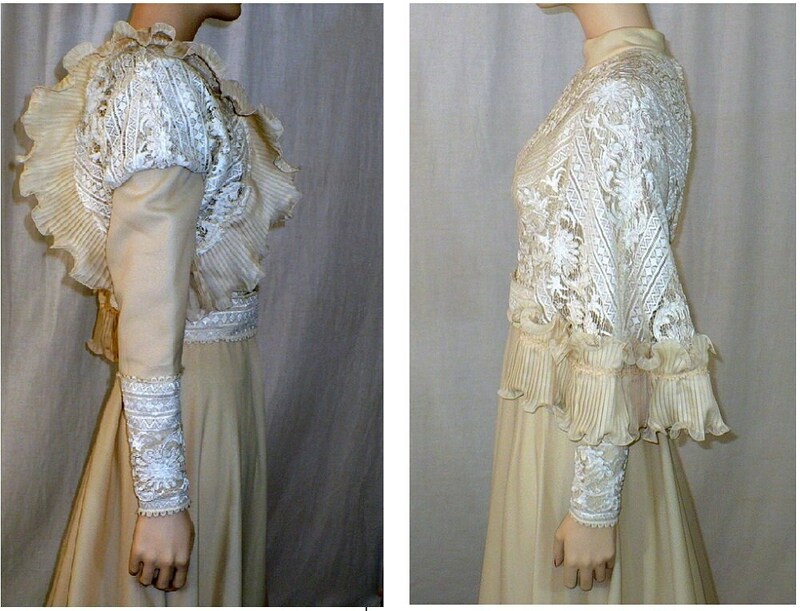 Dart-fitted bodice with band collar. Semi-fitted sleeves with loop and covered-button fasten at wrists. 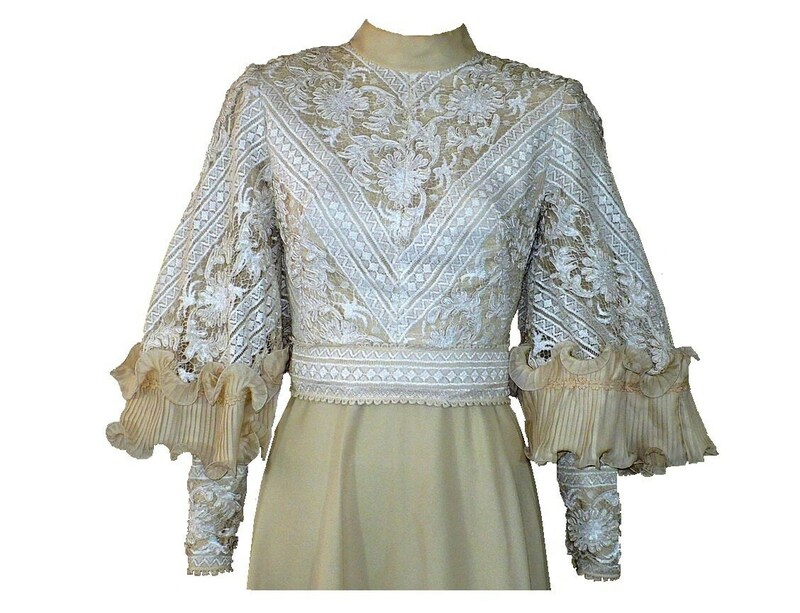 A second, dramatic, three quarter, lace, bell sleeve with pleated ruffle trim. Skirting and train is crepe polyester in ecru white, trimmed in pleated ruffle. The skirting has two layers of lining for the train. One of the layers of lining has a stain near the hem and can be seen enlarged in 4th image. Dress has been hand washed and line dried - and stain did not lift. Therefore this stain on inner lining is likely permanent. Please see photos. 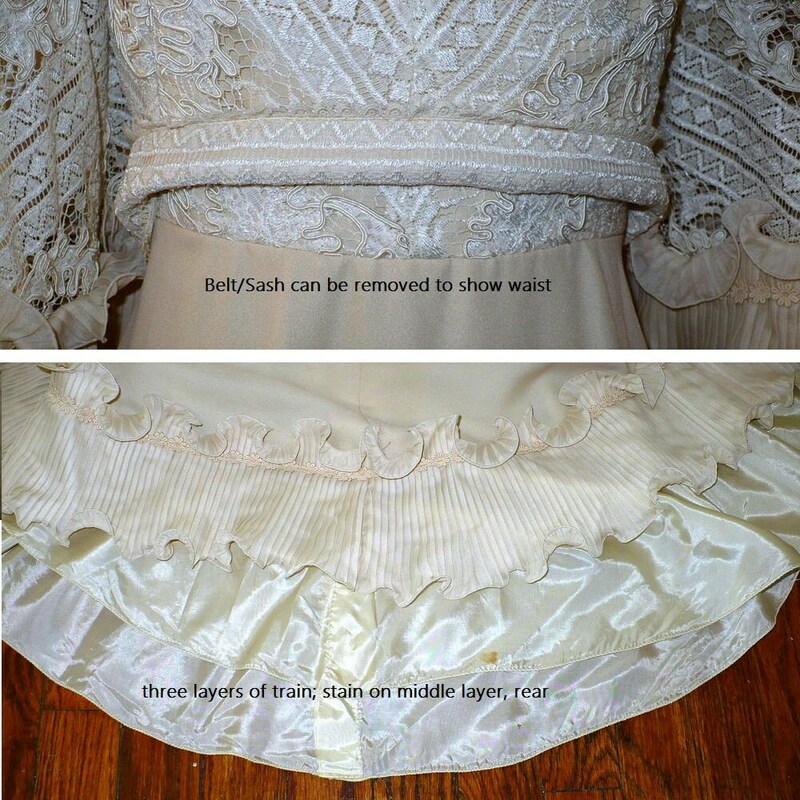 Note the belt/sash can be removed with a stitch picker if desired. If you would like us to remove this for you, just let us know in "notes to seller". The zipper is in perfect working order, however the mannequin is too large for the dress. It is displayed opened/unzipped at the back because of this. 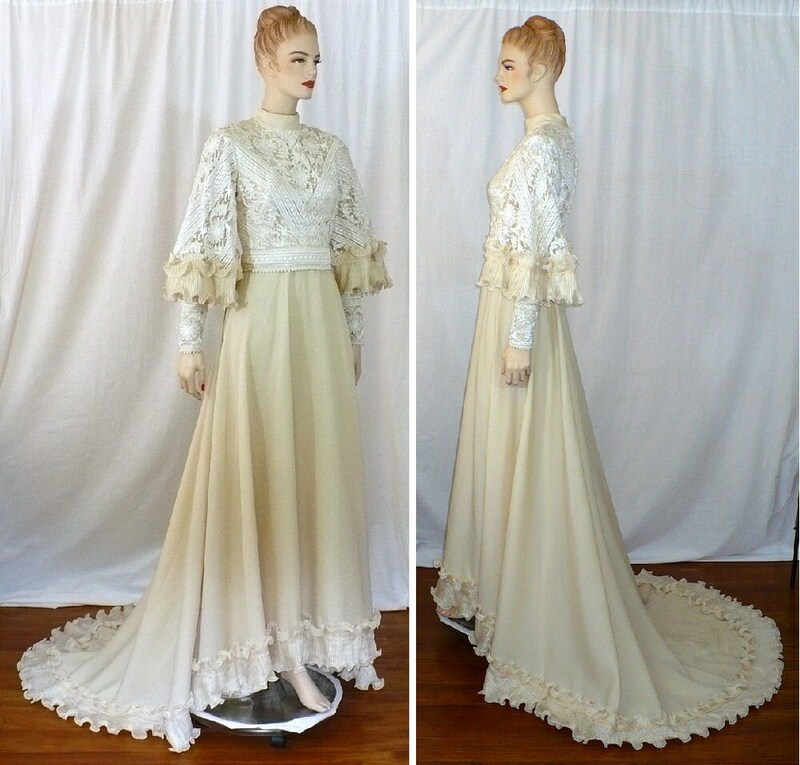 Center front skirt length: 43"
Center rear train/skirt length from waist: 66"
Outer bell sleeve length: 18"
Care Instructions: Dry cleaning is NOT recommended as many dry-cleaning solvents can swell the olefin fibers. Gentle hand wash and drip dry is best. Sweep: side seam to side seam at hemline, doubled.